Spanish Aktiv has two language schools on the island of Mallorca. Our classrooms in both Playa de Palma and in Santa Ponsa are bright and modern, so you can enjoy your Spanish lessons in a comfortable and supportive atmosphere. At both of our schools, in addition to our PCs and free Wi-Fi, we offer free educational material which can be used to further your Spanish outside of the course. Learn Spanish in comfortable, air-conditioned rooms and enjoy beautiful views of the beach and the sea while you study! You can enjoy spending your breaks barbequing or lying on the beach which is only a five minute walk away, and enjoy joint meeting with traditional paella and sangria. Students can also sit and listen to our popular lectures on culture and politics in our beautiful large garden with swimming pool. 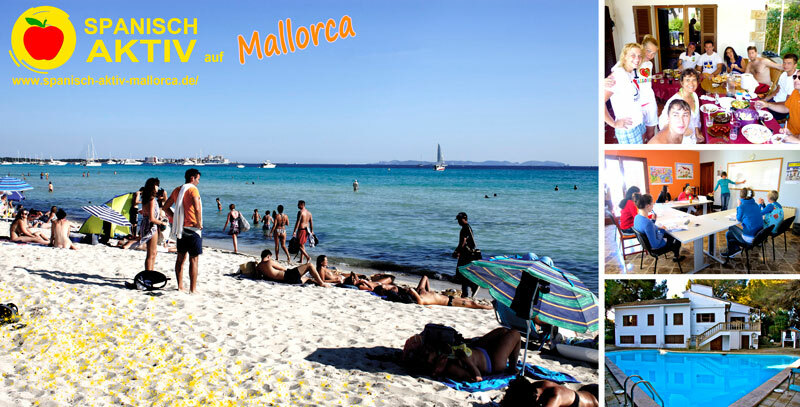 Learn Spanish and enjoy Mallorca! Accommodation for all of our students! We can even offer accommodation for students at our language school in Playa de Palma. Our school is big enough to house all participants, and half-board accommodation is included in the price of the course! If you would rather not live at the school, that is no problem. We have contacts on the island and can help students find somewhere else to stay. Enjoy the comfort of a hotel, the privacy of your own apartment or live with a Spanish host family so that you can practice the Spanish you have learnt after the lessons are finished! Learn more about our accommodation here. A range of courses to suit everyone! At Spanish Aktiv, we have a variety of different courses available, such as Intensive, Semi-Intensive and Private Courses. Spanish courses are available at all levels, starting from beginners and leading to advanced conversation classes, so there are courses to suit everyone! Feel free to choose the school that best fits you: learn Spanish in either Playa de Palma or in Santa Ponsa. We also offer specialised courses when requested. For example, we can offer courses to refresh your knowledge of Spanish, in Business Spanish, preparatory courses for high school and the DELE (Diplomas de Español como Lengua Extranjera, English: Diplomas of Spanish as a Foreign Language) exam, or a combination of listening and cooking class. The courses are also recognised as an educational vacation. Experience all that Mallorca has to offer! We want you to immerse yourself in the Spanish culture while learning with us at Spanish Aktiv. Both of our schools are located centrally in Mallorca, and all amenities are easily accessible. The beach is only a short five minute walk away, and the rest of the island is easy to reach. Our teachers have excellent local knowledge, so if there is anything you want to know or see, just ask! They are here to make sure that you have the best possible experience at Spanish Aktiv Mallorca, both inside the classroom and out of it. Study by day and relax by night with our live-in school in Playa de Palma or learn Spanish in the quiet, secluded Santa Ponsa. The choice is yours!